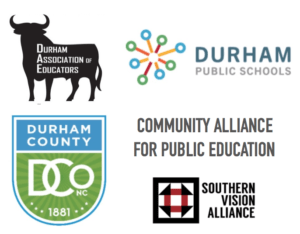 Durham Public Schools staff and parents campaigned in the spring of 2018 to pilot this model at five elementary schools. Thanks to investment by the district and the county, four of those schools began the school year with a full-time Community School Coordinator: a collective impact strategist who will strengthen the bridge between school and community. The pilot Community Schools are Southwest Elementary, Club Boulevard Elementary, Lakewood Elementary, and E.K Powe Elementary.